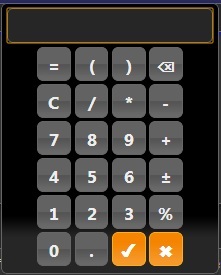 So to implement only numeric keyboard or only show numpad then use below jQuery code. An on-screen virtual keyboard embedded within the browser window which will popup when a specified entry field is focused. The user can then type and preview their input before Accepting or Canceling. Add custom keyboard layouts easily. Add up to four standard key sets to each layout that use the shift and alt keys (default, shift, alt and alt-shift). Add any number of optional modifier keys (meta keys) to add more key sets. Each meta key set also includes the shift, alt and alt-shift keysets - New in version 1.8.9. Position the keyboard in any location around the element, or target another element on the page. Easily modify the key text to any language or symbol. Allow direct input or lock the preview window. Set a maximum length to the inputted content. Scroll through the other key sets using the mouse wheel while hovering over a key to bypass the need to use alt, shift or meta keys. Easily type in characters with diacritics. Here are some default combination examples - it is possible to add more. Enable, disable or add more diacritic functionality as desired. Use callbacks and event triggers that occur when the keyboard is open or closed and when the content has changed, been accepted or canceled. As jQuery UI is a dependancy, this plugin's styling will automatically match the selected jQuery UI theme with the exception of the required CSS found in the keyboard.css file. Built in watermarking. It emulates HTML5's placeholder, if the browser doesn't support it. Typing extension allows you to simulate typing into the keyboard for demo purposes or to assist user input. Autocomplete extension will integrate this keyboard plugin with jQuery UI's autocomplete widget. Multiple region specific keyboard layouts included in a separate directory. This is a work in progress and slowly growing.